Nollywood actress and producer, Judith Audu, is one of many who has come to understand that there is a strong difference between work and family and she is not allowing the two to clash. The actress since getting married to her man, Morten Foght, has been able to draw the line and she has continued to ensure that her home is intact while she gets a strong support from her man in running her business. Judith does not miss hanging out or turning up for events with her hubby anytime he is in the country and that has enable them build a strong bond together just the way they stepped out for her brother’s wedding over the weekend. 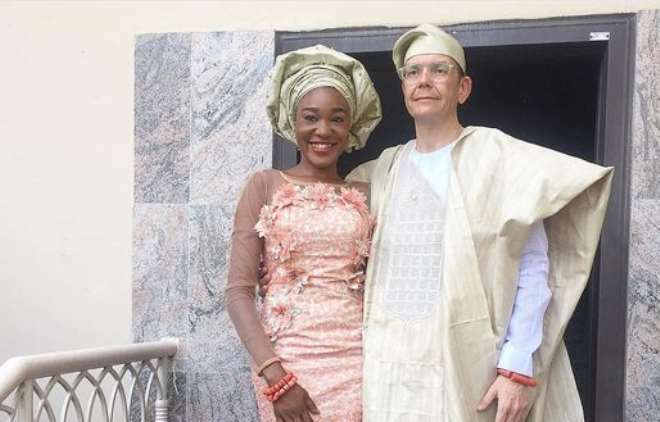 Despite being a foreigner, Judith’s hubby has found happiness in Nigeria that he spend more of his time here with his wife and he is already getting use to Nigerian dishes as he is always dressed in our local fabrics.